OWL's very own Dr. Roberta Wong Leung is pictured above in the Chinatown Parade as Model Mother of Year. She will also be in the Kamehameha Day Parade on June 8. Started in 2009, the Bella Project is currently celebrating its 10th anniversary. OWL Past President, Val Schmidt, coordinated volunteers for all the previous events. Eight years ago, Val took over the Bella Project along with OWL Past President, Tracie Young with their Junior League of Honolulu fellow member, Charise Shigeta. 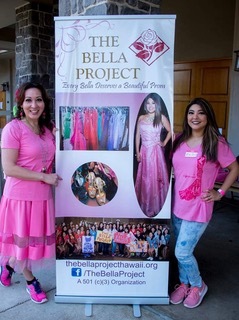 The Bella Project focuses on helping high school girls who are low income, special needs and critically ill get a free dress, shoes, accessories and makeup. They are also open to the public twice per year in spring and fall for Prom and Winter Ball. On January 26, 2019, they gave away 275 dresses with the help from 250 volunteers. They currently have approximately 1,500 dresses in inventory for their future events. Val is pictured with a young girl who got a dress when she was 16, then volunteered to present day 8 years later. This girl literally became The Bella Project poster girl. Renee Green was honored to speak at two veterans’ events in November to help women put action behind their dreams and surround themselves with positive influences. On November 16, Renee spoke on “Transforming the Way We View the Glass Ceiling, Past, Present, and Future.” On November 18th she spoke on “Getting your Roar Back.” Both presentations provided veteran women with an opportunity to keep following their dreams and never let someone put an end to what is only the beginning. Hawaii thrive. Selections of this year’s outstanding leaders in philanthropy were made by a panel of community leaders. University of Hawii Foundation. Great job KC! Dr. Roberta Ann Wong Leung was named United Chinese Society’s 2018 Model Chinese Mother of the year. A reception for Roberta was held on Saturday June 16, 2018. JULIE ARIGO, General Manager of Waikiki Parc Hotel and the 2017 President of OWL has been named a 2018 LeaderLuncheon Honoree by the YWCA Oahu. Congratulations Julie! Janice Nielsen recently went over the edge but don't worry, it was for a good cause. Janice took part in the ninth annual Special Olympics Hawai’i’s popular Over the Edge fundraiser. Each year Over the Edge participants rappel more than 400 feet down the side of the iconic hotel, while enjoying unparalleled views of Waikiki and Diamond Head. Congratulations Janice and thanks for support such a worthwhile organization. Belinda Lau was recently featured in Pacific Edge magazine, Apr/May/Jun edition, Family Ties: Family-owned and operated businesses. As a partner in business with her husband, Stanley Lau, the wife-husband team runs Hawaii Tech Support. Belinda's company specializes in assisting small businesses with their servers and computer networks. Congratulations Belinda! Dr. (ret.) 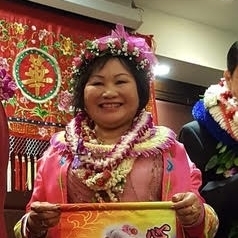 Roberta Wong Leung was installed as the President of the Chinatown Lion's Club. The Chinatown Lion's Club has a 40 year history of service to the Honolulu community. The Lions develop projects and activities geared to the needs of the community, participate in an international program of fellowship, based upon service wherever the need exists, and serve humanity without thought to race, creed, nationality, religion or politics. Val was able to join the student-leaders for lunch, during which time the junior class leadership team asked Val if they could sit with her and share their goals and dreams for the coming year. The next morning, the girls awoke to an email from Val that praised them for their initiative and willingness to share their goals and dreams. Included in the email was a pledge of support from Val to begin funding their first initiative! Needless to say, the girls were surprised, inspired, and elated. The girls were so fortunate to have spent an afternoon with Val who is an outstanding example of leadership, mentorship, and paying it forward! Tracie Young and Pam Harms. On May 5th, OWL members, OWL members Tracie Young and Pam Harms volunteered at St. Andrew’s Schools, working with the Priory in the City - Junior class. Tracie and Pam took on the role of interviewer; ‘interviewed’ students and offered feedback and suggestions to improve cover letters, resumes and interview readiness. Mimi Beams was recently featured on the cover of MidWeek in celebration of the 40th anniversary of Hawaii Pacific Health Women’s 10K, a race Mimi co-founded in 1978. On March 5th, some 1,500 women gathered for this 6.2-mile run from Kapiolani Park through Diamond Head, Kahala and back. As Mimi puts it, the race is all about “women empowering women” and was conceived as a way for women to be able to cross the finish line and win at a time when women's athletics was just taking off. Today, the race is sponsored by Straub Medical Center and places a special emphasis on women's health. Proceeds from the race go to women’s programs at hospitals, and informational booths at the race distribute reminders about cancer screenings and other women's health issues. 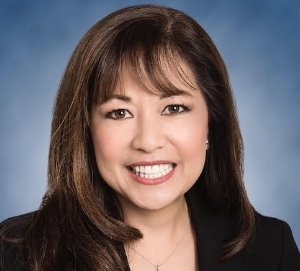 Mona Choy-Beddow, Senior Vice President and Hawaii Regional Manager for HomeStreet Bank, was recently honored by the Pacific Business News in the category of Industry Leaders. This is the second time Mona has been named as an honoree in the Women Who Mean Business category and it speaks to Mona’s prestigious reputation on the Hawaiian Islands, as well as HomeStreet Bank’s continuous efforts to promote diversity in its workforce. The publication awarded individuals on the basis of leadership within their respective industries and within their organizations. A further requirement was that award recipients had to exemplify an extraordinary commitment to community service. In the 17 years Choy-Beddow has been with HomeStreet Bank she has been instrumental in the growth of the highly successful publicly traded bank. In the last two years alone Mona has grown deposits on the Hawaiian Islands approximately 20%. UH Mānoa TIM School alumna, Dr. Roberta Wong Leung (1971), has been elected the 2017 president of the Associated Chinese University Women, Inc. (ACUW) and the 2016–2017 president of the Honolulu Business and Professional Women Association (HBPWA). Founded in February 1931, ACUW strives to further the cultural, social and intellectual welfare of its members and the community and to promote and participate in worthwhile community projects which are non-profit and non-commercial. The goal of HBPWA is to achieve equity for all women in the workplace through advocacy, education, and information. It was founded on December 13, 1921, and is celebrating its 95th anniversary.